This lovely advents calendar has a high stability by the wood processing. - Dimensions (total): 60 cm x 10.5 cm x 20 cm. Box´s inside dimensions: 20 mm x 32 mm x 33 mm. 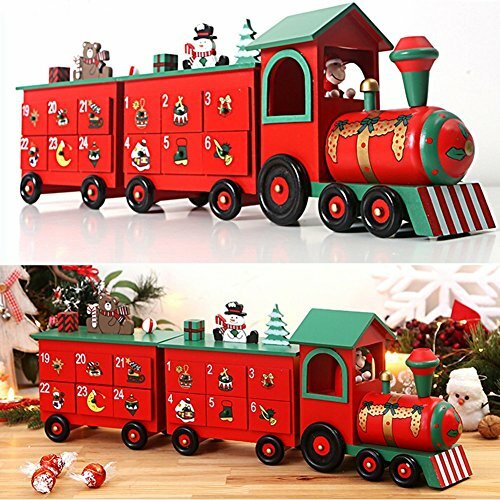 CHRISTMAS TRAIN ADVENT CALENDAR - Total dimensions: 60 cm x 10.5 cm x 20 cm. Box´s inside dimensions: 20 mm x 32 mm x 33 mm. COUNT DOWN THE DAY: Put small trinkets, candies, or anything else you want into the 24 drawers and take one out each day until Christmas! MANY OPPORTUNITIES：Create your very own advent calendar with many different small surprise gifts. Perfect for small sweets such as chocolate, jellybaby, wine gums, gobstoppers, barley sugars, macaron treats etc. PERFECT CHRISTMAS DECORATION - Bring some pre-Christmassy atmosphere in your home with this superb wooden advent calendar. Very detailed and lovingly painted wood let this advent calendar appear authentic. No matter what your decoration style, this advent calendar is sure to fit in perfectly!Count down the days until Christmas day with the numbered drawers on this advent calendar. If you have any questions about this product by Zebery®, contact us by completing and submitting the form below. If you are looking for a specif part number, please include it with your message.